**** Chosen by Winner: Marius V.
Awesome is the only adjective that even begins to describe this Laredo Bowie. It features a long, heavy blade made from O1 high carbon steel, which is flat ground to produce incredible cutting power and perfect balance. And, as an added bonus, it is given an absolutely ferocious cutting edge that terminates in a dagger sharp point. 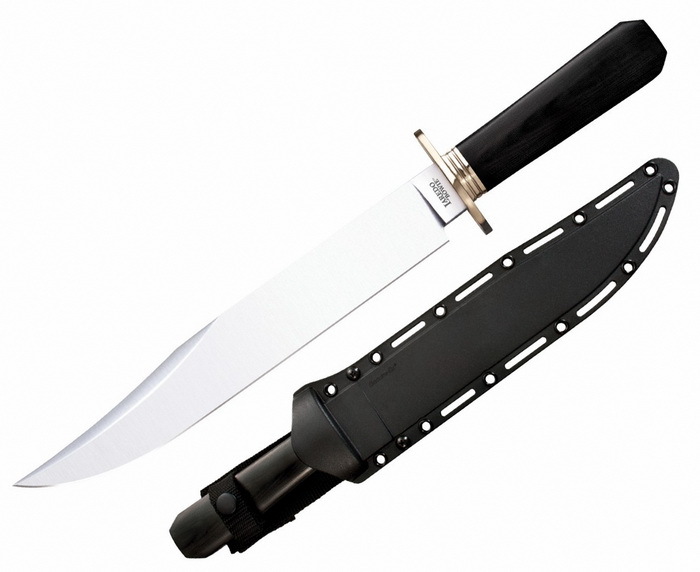 To further enhance its versatility and efficiency as a weapon, it sports a four and a half inch long semi-sharpened clip point that helps facilitate the deadly back cut, as well as a wide variety of more conventional cuts and stabbing attacks. The smooth Micarta handle is as tough as it is beautiful. It is specially contoured to fit the hand like a glove and to provide a positive grip when cutting, chopping or thrusting. Cold Steel, Incorporated was founded in 1980, a company dedicated to making the strongest, sharpest knives in the world. Over the last three decades, Cold Steel has been at the forefront of the many innovations that have helped to define the knife industry as a whole. Progressive accomplishment, including the introduction of the checked Kraton® handles, and the tanto point blade styles have gone from curiously interesting features to industry-wide hallmarks of quality and sophistication. New ground was also broken with the introduction of unique new blade steels like San Mai III® and Tri-Ad™ Lock & locking mechanism for folding knives. Tri-Ad™ Lock for example, has never been equaled by any of Cold Steel’s competitors and nothing they have produced yet has been proven to outperform it. Of course Cold Steel will always look to the future, constantly striving to make the world’s strongest, sharpest knives. That goal as elusive and difficult to achieve as it is, has been the same for the past thirty years.